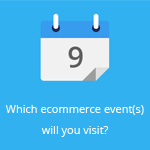 June 27, 2014 by Ecommerce News. 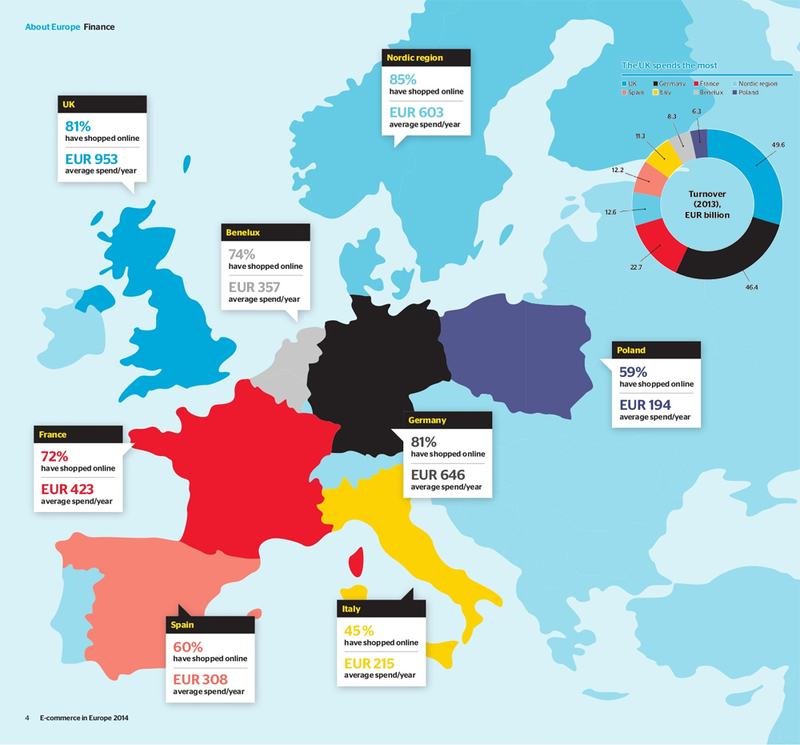 About Cross-border, Statistics with tags Europe. 6717 views. About 240 million consumers in Germany, the United Kingdom, France, Spain, Poland, Belgium, the Netherlands, Italy, Norway, Denmark, Norway and Finland bought goods online to a value of almost 170 billion euros last year. More than half of ecommerce consumers have ordered online from abroad at some time during 2013. That’s one of the conclusions from a pan-European survey conducted by PostNord, which normally only conducts these kinds of surveys for the Nordic ecommerce market. “ The reason why we are now, for the first time, publishing an European ecommerce report is the rapid growth in ecommerce and an increase in interest in the Nordic region and Europe from ecommerce companies in Asia and the USA”, says Håkan Ericsson, President and CEO of PostNord. In the Nordic region, which has the highest level of Internet penetration in Europe, 4 out of 5 respondents bought goods online last year. In the United Kingdom and Germany, widely seen as the top ecommerce countries on the continent, there are comparable percentages. Around 100 million consumers between the ages of 15 and 79 bought one or more products online in these two countries alone. The highest average amount that’s spent on buying goods online can be found in the UK, where the average online shoppers spent 953 euros. 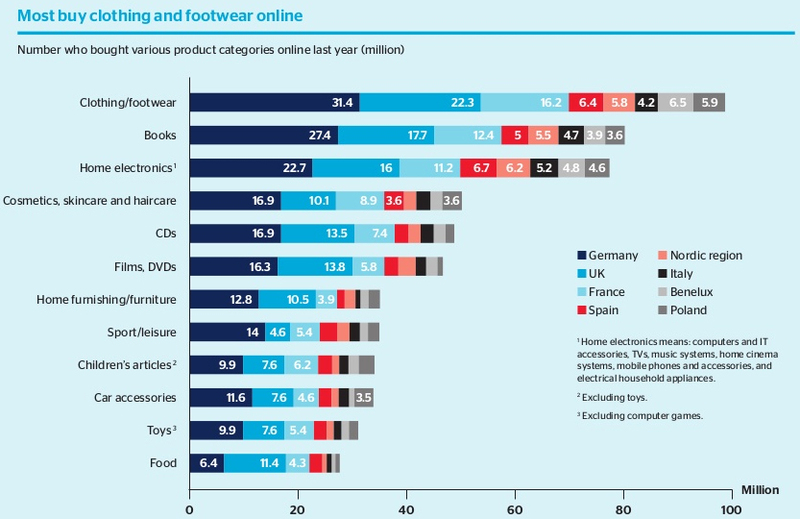 The most popular product categories in Europe are clothing and footwear, home electronics and books. In the Nordic region, Spain and Italy it’s not clothing and footwear that tops the list, but home electronics are the most popular products over there. According to PostNord cosmetics is one of the product categories that can show some serious growth in the near future. Over the last year, it was mainly the ‘big three’ (consumers from Germany, the UK and France) who bought skin care and cosmetics via the Internet. Sport and leisure articles is also a category that has seen an increasingly rapid level of growth online in recent years. Especially in Germany, where about 14 million consumers bought these kinds of articles online last year. In second place were the French, with 5.4 million shoppers. PostNord also looked at how important the pricing of products is. It seems that at least half of online shoppers in Italy, Spain, Poland and France think it’s very important that a product has the lowest price if they are to be interested in buying it. Quick delivery is also very important. Most online shoppers in Europe expect their products to be delivered within three to five days at the most. As for free delivery, Spanish and Italian online shoppers are most insistent on this incentive, with 64 and 63 percent respectively thinking this is very important if they are going to order online. On comparison, in the Nordic region the same factor is only 17 percent. The survey also contained some questions about cross-border sales. It turns out that 4 out of 10 consumers have bought from foreign sites, with the Nordic region (56%), followed by the UK with 54%, as the region where there’s the highest proportion of consumers who have – at some time in 2013 – bought from foreign websites. Online consumers from the UK like to buy from the USA and China, while Nordic consumers choose to order online from the UK, followed by the USA.